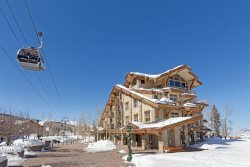 Located downtown Telluride, 1 block from Telluride Town Park Festival Grounds, this is the perfect condo. Completed in 2006 as a custom residence for the architect, this condo has virtually every high-end finish you could imagine. The 12' ceilings and 8' interior doors create special loft living spaces. Storage capability, cabinets, and closet spaces are abundant. The building exterior is contemporary/rustic. The interior finishes include rustic panels surrounding the fireplace, American Clay specialty wall finishes, granite countertops, designer lighting, and top of the line appliances. Beautiful wood floors are accented with tile inlay and the custom bath tile designs are accented with copper inserts. Custom woodwork (crafted on property) includes wrapped beams w/rope light accents, wainscot, window/door trim and niche storage spaces. "Whole house" digital sound system includes outdoor speakers on the back deck. You will enjoy maintenance-free living with a heated garage, snow melt in the driveway and snow melt on the deck. The location of the property was awesome. The location also had a very cozy feel. We will be using latitude 38 again. Staff was great. After hours issue with beeping alarm handled very quickly. Trevor, I think, was the person who helped. overall excellent experience. our original booking property was sold and we were given and upgraded property that we thoroughly enjoyed. thank you! Latitude 38 is comprised of a fantastic team of warm and friendly agents who seem to stop at nothing to make the rental experience truly wonderful with a great personal touch. • Damage Protection: $59.00 – Protects you up to $1,500.00 in accidental damage, theft or lost keys to a home.